A year-long campaign for international ranking points and knowledge of the Olympic eligibility rules helped Mike Beres get into the 2008 Olympics. Events: Badminton, mixed doubles with Valerie Loker of Laval, Que. 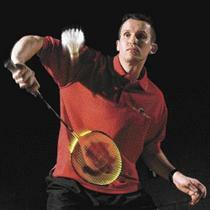 Career highlights: 2007 Pan-Am Games, gold medals in men's singles and doubles and silver medal in mixed doubles; 2007 Canadian championships, won men's singles and doubles and mixed doubles; 2004 Summer Olympics in Athens, top 32 in mixed doubles; has won seven senior and three junior national titles. "As a badminton player, it's difficult to qualify and each time it's a struggle," he says. "I feel privileged to qualify that many times. "But I almost didn't qualify (for Beijing). You think it would get easier after the first two times." The road to the Olympics, whether it led to Sydney in 2000, Athens in 2004 or Beijing in 2008, has always been treacherous for Beres. As a doubles player, he has followed a year-long international circuit that has taken him to 23 tournaments in 23 countries, chasing international ranking points to earn one of the precious few Olympic spots. This also came at a price of between $20,000 to $30,000 for travel, accommodation and food. If he did well, there may have been prize money to offset that week's expenses. There was also the physical and mental struggle to stay sharp as he played quality international players week after week while his own fitness level slowly deteriorated. The road to the Beijing Games was the worst Olympic adventure for Beres, 35. Six months into the qualifying process, he lost his federal funding of $1,500 per month through Canada's Athlete Assistance Program. "I was more or less told it was time to move on," said Beres, who narrowly missed the required top-16 ranking in mixed doubles at the 2007 world championships to maintain his senior international carding. Coincidentally, 2007 was his best season in 13 years on the national team. Not only did he win all three titles -- singles, doubles and mixed doubles -- at the Canadian championships, but he also captured two gold and one silver medals in the Pan-Am Games at Rio de Janeiro. While he was without federal funding for six months, he did receive more than $7,200 from Quest for Gold, the provincial athletic assistance program. An RA Badminton Club member also gave Beres $2,500. At about the same time his federal funding stopped, Beres and partner Valerie Loker of Laval, Que., stopped circling the world for Olympic qualifying points. They were in second place in mixed doubles and felt they were too far behind the Americans, who appeared to have a solid hold on the lone Pan American zone spot for the 16-entry Olympic draw. Beres, however, continued pursuing a berth in men's doubles with Will Milroy of Edmonton, but missed the mark. At the end of the 12-month qualifying process in May, though, the Americans helped Beres and Loker without them even knowing it. Beres knew his qualifying rules and made the Americans aware of it. The United States finished first in Pan-Am zone qualifying in men's doubles, women's doubles and mixed doubles. However, under Olympic qualifying rules, no country is allowed more than two qualifying spots in doubles. Beres knew that, but the Americans didn't. He informed them of that rule, but the United States Badminton Association took an extra month after the qualifying period ended to determine which two doubles teams it would send to Beijing. Fortunately for Beres and Loker, U.S. officials picked the men's doubles and women's doubles. Still, the extra wait left Beres frustrated as he still trained as if he was going to his third Games. Beres and Loker didn't learn they were going to the Olympics until June 6. "In my gut, I always figured I got the spot," said Beres, who has reached the mixed doubles final with Loker, but lost in the men's doubles semifinals with Ottawa's Joseph Rogers in this week's U.S. Open badminton championships in Orange County, California. "It was a long month," Beres added. "I kept thinking, 'Why are they taking so long to decide.' They talked to their lawyers to see if they could keep all three (teams). It kept me up at night. Instead of being excited (about making the Canadian Olympic team), it was more relief. "The whole year was a rollercoaster and they added a corkscrew twist at the end." Beres is accustomed to fighting his way to get to the Olympics, though. In his 23rd and final Olympic qualifying tournament in 2000, he and partner Kara Solmundson of Winnipeg had to reach the semifinals to go to Sydney. Four years later, for the Athens Olympics, Beres said the athletes were given misinformation about the qualifying standards by Badminton Canada. Again at the last qualifying tournament, he and partner Jody Patrick of Calgary lost their final match and thought there were eliminated. In the end, they later learned they had made the Games. Since returning from the year-long international qualifying circuit, Beres has lost 20 pounds, regained his fitness and sharpened his game, as indicated by his U.S. Open results. "I don't play this for money. I just love playing badminton," Beres said. "This year with all of the travel, I haven't trained properly. At the end of May, I was out of shape: 23 international tournaments in 23 countries. You're always trying to be peaking. You're resting and not training properly. "There's plane travel, jet lag and eating hotel food with more calories than what you need. By the end, my badminton was very good, but my fitness was at it's lowest point." Now that he's at home in Ottawa with his wife, Jo-Anne, (they were married in May 2007), he's eating well, sleeping properly, losing weight and regaining his fitness. "It's nice to concentrate on being a good, healthy badminton player. I'm playing well now." The RA Badminton Club will stage an Olympic sendoff for Beres and clubmate/singles player Andrew Dabeka of Ottawa on July 22 at the RA Club at 7 p.m. Tickets are available at the door.